Apparently, I've begun this week with links. Monday and yesterday both featured bays. Yesterday and today both have puns in their titles. What will tomorrow hold? 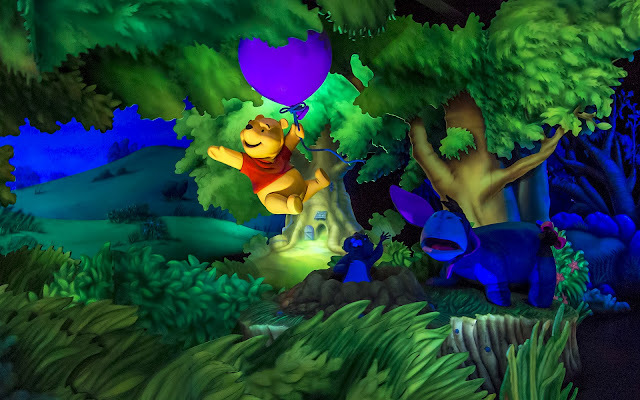 Guests who wander toward the back of Critter Country, not looking to ride Splash Mountain, might instead opt for The Many Adventures of Winnie the Pooh, a dark ride attraction that replaced the former Country Bear Jamboree show. Though its predecessor is certainly a classic show, Winnie the Pooh is a cute attraction in its own right. With colorful and whimsical scenes from the beloved books and Disney-adapted movie, it's a fun ride for children and families. Though there's nothing really spectacular, Winnie the Pooh provides an escape from the crowds on busy days and a bit of cool down--be it via the interior air conditioning or perhaps those occasional gusts that seem to stir up in Hundred Acre Wood! Winnie the Pooh hangs onto a floating balloon on a windy day in Hundred Acre Wood.